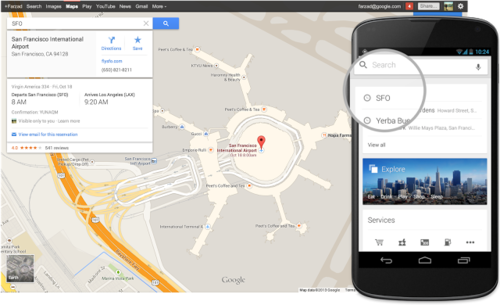 Google Maps now lets users search for restaurant, flight and hotel reservations. When's dinner? Just ask Google ... Maps. On Wednesday the company announced it is adding more smarts to its Maps software to incorporate personalized search results such as hotel, flight and restaurant reservations, as well as upcoming event listings. If the features sound familiar, that's because Google rolled out some of the same functions for its regular search engine in August. Still, the Maps features announced on Wednesday follow three months of user feedback collected since Google revamped Maps earlier this year, the company said. One of the most requested features? Directions for multiple destinations. With the new Maps, users will be able to plot more than one destination for a trip. After choosing a starting point, people can click the "+" sign to add stops and directions to the route, Google said. The new capability works for driving, walking and biking directions. Finally, Maps users can also search for upcoming events at various venues, even if they don't have a reservation. People can search for, say, Radio City Music Hall or the O2 Arena, and a card will appear showing a schedule of concerts, sports matches and other nearby events, Google said. Google unveiled several new search features related to comparisons and filters last month when the company turned 15. Google first previewed the new interface, recommendations and real-time satellite imagery for Maps at its annual I/O developer conference this past May.